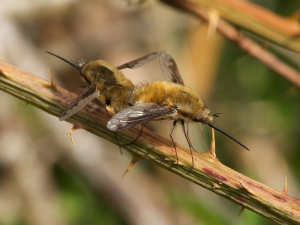 Observation - Bee-flies - UK and Ireland. Description: Images of Bee-flies. These strange looking flies are masters of flight and can hover perfectly. Their larvae live as parasitoids in mining bee nests. Images of Bee-flies. These strange looking flies are masters of flight and can hover perfectly. Their larvae live as parasitoids in mining bee nests.